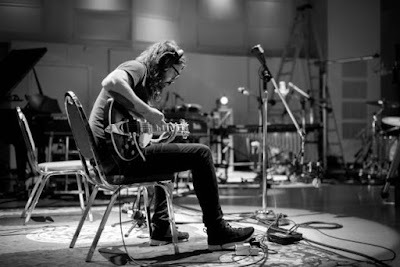 The project documents the inspiration and live recording of a solo 23-minute composition by the Foo Fighters leader that sees him perform the song on seven instruments over the course of three days in the studio. The entire tune was played by Grohl, each time on a different instrument, live for 23 minutes. Beginning with the recording of the entire drum track purely from memory, with no sheet music or guide tracks, followed by guitar, then bass, then keyboards, and so on… Grohl tasked himself with a one-man-band recording session that was forced to start from the very beginning of the 23-minute song any time the slightest mistake was made or if he felt he could do a better take. The "Play" online interactive experience offers viewer/listener/participants the options of taking in the mini-doc and Grohl performance as is, focusing on one instrument, and/or downloading "Play" sheet music. The online version also includes a list of organizations where time, money and instruments can be donated to the cause — and places where musicians young and old alike can have the opportunity to play live music.